In this post I continue legacy Public Switched Telephone Network (PSTN) technology coverage. There are two methods currently used to provide numbers to the telephone company, pulse or rotary dial service and dual tone multi frequency dialing. Let's look at pulse or rotary dial service in this post. In the past, when a handset was lifted, the caller did not hear dialtone, the caller heard an operator asking for the number the caller wanted to dial. 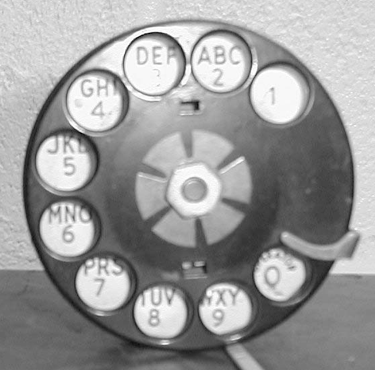 As the number of telephones grew, telephone companies projected that hundreds of thousands of new operators would be needed so rotary dials were added to telephones. Rotary dials were invented to eliminate operators and use dial pulsing to automate the switching required to get from a caller to a receiver. The rotary dial generates pulses on the local loop by opening and closing an electrical switch when the dial is rotated and released. Each pulse opens the loop and interrupts the local loop current flow of 20 - 120mA resulting in a series of current pulses on the local loop. This process is referred to as out-pulsing and pulses are generated at a rate of ten pulses per second. Each pulse is actually an interruption in current flow on the loop and is .05s with a .05s pause between pulses. Each number on the dial corresponds to the number of pulses produced for that number. For example, dialing the number 4 produces four pulses as indicated in the figure below and takes a total of .4 seconds (￼8 x ,05 seconds = ,4 seconds). As you can see, rotary dialers are slow when compared to modern telephones today. How long does it take to dial the single number "9" on a mechanical rotary phone? As telephone manufacturing technology developed the rotary dials were replaced on many phones with a push-button keypad. These keypads use an electronic circuit to generate the pulses, not a mechanical rotary dial. Since people can punch numbers very rapidly and pulse signals still must be .05s long and be separated by .05s pauses, this type of dial is equipped with a buffer that stores numbers as they are keyed. The buffer then out-pulses the numbers with the proper timing intervals. You may also have noticed a telephone "digital" keypad number sequence is opposite that of a calculator. This was done purposely to slow people down when dialing on pulse generators. Pulse generation phones still work on the Public Switched Telephone Network (PSTN). It's amazing the telephone companies still support these now almost obsolete phones! In my next telephone technology post I'll cover dual tone multi frequency dialing. The Break pulse is slightly longer than the make. The North American standard is 60/40 percent; most of Europe accepts a standard of 63/37 percent. This is the pulse measured at the telephone, not at the exchange. Most exchanges will accept both standards with some tolerance.